Reply for 'Mr Campbell', to his surgeon, Alexander ('Saunders') Dunlop, advising on his continuing treatment. 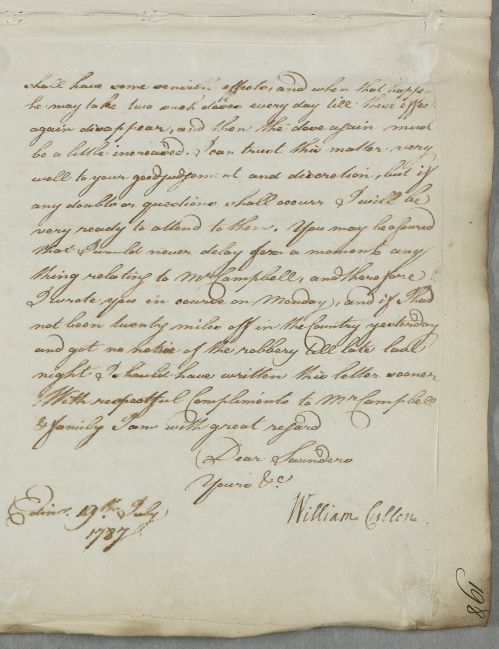 Cullen repeats what he has said in his previous letter, which 'has been prevented by the robbery of the Post from coming to your hand', and concludes: 'if I had not been twenty miles off in the Country yesterday and got no notice of the robbery till late last night I should have written this letter sooner'. Summary Reply for 'Mr Campbell', to his surgeon, Alexander ('Saunders') Dunlop, advising on his continuing treatment. 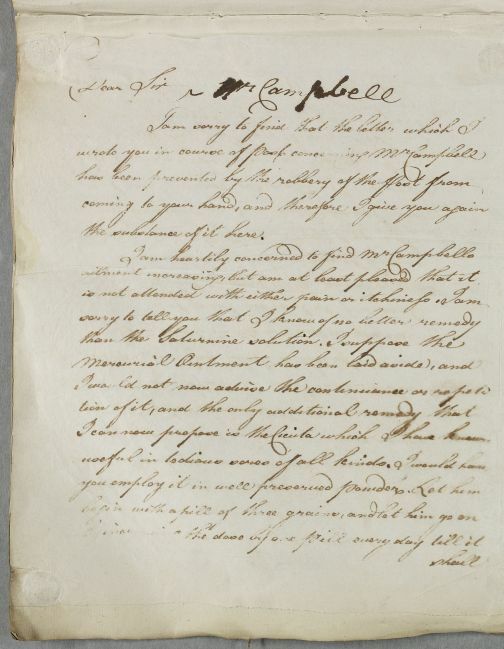 Cullen repeats what he has said in his previous letter, which 'has been prevented by the robbery of the Post from coming to your hand', and concludes: 'if I had not been twenty miles off in the Country yesterday and got no notice of the robbery till late last night I should have written this letter sooner'. Case of Mr Campbell of Succoth, who has a 'movable tumour' on the lower lid of his left eye. the substance of it here.